The adjustable dumbbell has been around for over 3 decades. In the mid-1980’s weightlifting at home was becoming increasingly popular, the convenience of training at home was starting to become more attractive to men and women with busy lives who were short on time. With limited space and small budgets, a set of adjustable dumbbells proved to be the most popular choice. Owning a set of adjustable dumbbells allows you the freedom to work out when you want and where you want. Easily accessed and stored the adjustable dumbbell was here and it was here to stay. The old school sets still prove to be a popular choice today, they are cheap, durable and their versatility outshines some of the newer sets, why? Because one of the major flaws of the newer sets is the lack of an option to add extra weight to the weight range later on when your strength increases. With old-school sets you can simply buy extra iron weight plates as and when needed. Adjustment times of these sets are slow as you will need to manually add and remove the weight plates. Adjustable dumbbells have come a long way since the days of spin-locks and manually loaded plates. You now have an assortment of adjustable dumbbells on offer, with adjustable systems built for speed like the Dial A Weight of the Bowflex, and the Twist-Locks of the Corefitness and Stairmaster sets. Powerblocks’ pin stacking systems and Ironmasters’ Quick-Lock were both built and designed for serious weightlifters with their excellent expansion packs and durable builds. This could be one of the major deciding factors for you when choosing a set of adjustable dumbbells, just how easy is it to select different weights? Speed also will come into play here so let’s first have a look at the Twist-Lock system of the Corefitness and Stairmaster adjustable dumbbells. The twist lock design is the fastest adjustable system on the market today, to select and change the weight setting simply takes one twist of the wrist. Very easy and very secure, you place the dumbbell in its cradle (2 cradles are provided with each set), you then twist to the selected weight you wish to lift, remove the handle from the cradle, leaving the unselected weights behind in the cradle. You will be happy to know you can not twist the handle when it is out of the cradle, this makes for secure weight plates with no rattle. PVC weight coating could crack if dropped. Not too dissimilar to the Twist-Locks except here you have the option for adjusting a different weight for each end of the dumbbell. Some people may favour this feature over the Twist-locks as it gives you the option for offset lifting. Again a very fast system to adjust, simply adjusted by turning the dial to the desired weight. The Dial A Weight was the first of its kind and it is a patented by Bowflex. Slightly more durable than the Twist-Locks and Dial A Weight systems, selector pins work by removing and adding a magnetic pin. You select a weight from the dumbbell weight stack and remove the handle from the weight stack leaving the unused weights behind. This system works great because it makes for a compact dumbbell, by this I mean the handle only increases in length as more weight is loaded. Much better than fixed length handles that can be awkward to train with. The closer we can get to the feel of a fixed weight dumbbell the better, the more natural the feel, the easier to train with. 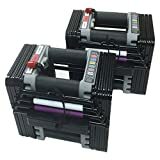 Sets like the Powerblocks have expansion packs available up to 90lbs per dumbbell with the elite range but they also offer heavier sets with up to 120lbs for the extreme lifters. Perhaps the slowest to adjust of the new school adjustable dumbbells because you have to manually add the weight to the handle, but it’s by far the most durable of all. You can adjust the weight by sliding a steel lock pin through the dumbbell until it reaches the stopping point and then with a simple half twist of the wrist the pins lock in place. The quick lock system was designed by Ironmaster and makes this set rock solid. Heavy duty all metal construction, it’s a kind of mix of old-school plates and new school adjustment speed. Are they the best adjustable dumbbells on the market? Yes, in my opinion, they are tough, fast to adjust and can be weighted at 165lb per dumbbell. The length of the handle is something most reviewers will miss out but it is to a certain degree quite important. Whilst it’s not a deal breaker handle length can be a distraction when you are lifting weights. Longer handles tend to hit your hips when curling, can clash above your head when pressing and can also hit the side of your head when pressing. You do get used to longer handles after a few weeks but they can still prove to be awkward. When looking for your set of dumbbells compacts is best, a compact design will give you the natural feel you get with fixed weight dumbbells (similar to the feel you get using commercial gym hex or rubber dumbbells). When choosing the right set of dumbbells for you, you will need to consider your strength gains, many of the sets do not have the option of adding extra weight, whilst the vast majority of you will not outgrow the 5- 50lbs per dumbbell weight range sets like the Bowflex, the more serious lifter may want to consider sets that offer expansion packs. Expansion packs give you the option of adding extra weight packs to your set when your strength increases and you outgrow the dumbbells weight range. So it’s something to think about if you’re going to take weight lifting seriously, you don’t want to be sat there in a years time having to splash out another $400 on a completely new set of heavier dumbbells. The amount of plastic used in some of the new school sets is somewhat alarming considering the nature of weightlifting. Nearly all of the new sets have some sort of plastic designed into their construction apart from the Ironmasters. What does this mean? Training to failure is not an option, it’s not advisable to drop any of the sets of dumbbells especially from a height. Powerblock are probably one of the more tougher sets of adjustable dumbbells and they only recommend a drop of no more than 6-12 inches. The others I wouldn’t risk dropping from any height because of the plastic surrounding the weight plates, this could easily crack and as mentioned early drops are not covered in the guarantees. Some of the sets will increase in weight in 2.5lbs others in 5lbs, for beginners jumping up in 5lbs might be a bit too much for some exercises. Core Fitness Adjustable Dumbbells Review – With Video!